Autonomous or self-driving cars may still seem like something from the future but that future may not be that far off anymore. Google has famously been researching the technology while automakers have also been trying to get their feet wet in it. 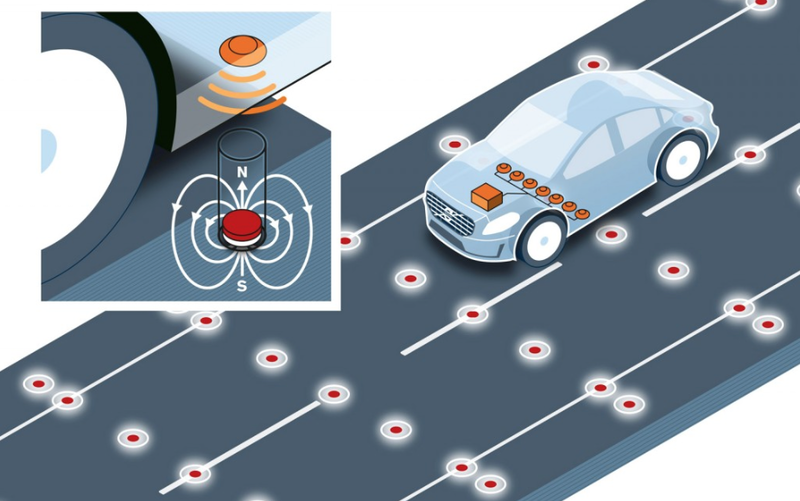 Volvo, for example, envisions a world with magnets in the road which will help guide the cars of the near future equipped with magnetic sensors themselves. By creating a railway-like system, cars will be able to stay in their lane. Sounds far-fetched but the Swedish automaker recently conducted the Volvo research project which included placing magnets about 8 inches below the road's surface. Magnets, according to Volvo, aren't affected by rain or snow unlike sensors and transmitters which are being tested out by other companies for vehicle to vehicle (V2V) and vehicle to infrastructure (V2I) communication. But this seems like the only advantage magnets would have. Having magnets installed in roads would not only cost a lot of money but sounds quite impractical. The United States has roughly 4 million miles of roadways, and according to Wired, it would cost close to $160 billion to install such sensors in all that asphalt. Granted, V2V and V2I systems are quite expensive themselves, but money doesn't seem to be the issue. Installing magnets in every piece of road in the country is not going to be easy. Roads are publicly owned and operated, and local governments will have to be put in-charge of installations. Having private companies come up with the technology without government dependence seems like the way to go. To Volvo's credit, the automaker is at least trying to advance the autonomous car technology. How soon will we see self-driving cars is not known. What is known, however, is that improving road safety is paramount and automakers and governments alike are working towards finding ways to do that.